On Thursday 11 December 2014, the SHARES project/Amsterdam Center for International Law in cooperation with Cambridge University Press will organise a book launch in the Hague to present the first volume of the SHARES book series: Principles of Shared Responsibility in International Law: An Appraisal of the State of the Art. 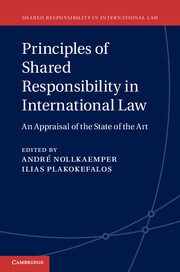 The book contains a critical review of the established principles of international responsibility as developed by the International Law Commission – that are widely considered to be the state of the art in the law of international responsibility – from the perspective of shared responsibility. The volume also identifies any developments that might de lege ferenda provide for a better fit between the law of responsibility and shared responsibility. The two editors of the book Professor André Nollkaemper (director of the SHARES project and professor of public international law at the University of Amsterdam) and Dr. Ilias Plakokefalos (post-doctoral researcher in the SHARES project at the University of Amsterdam) will provide a short introduction to the volume. His Excellency Judge Peter Tomka (president of the International Court of Justice) will provide some general remarks about questions of international and shared responsibility, and their connection with the work of the ICJ. Professor Pierre d’Argent (professor at the University of Louvain (UCL)) will give a presentation on the subject of his chapter ‘Reparation, Cessation, Assurances and Guarantees of Non-Repetition’ (chapter 7 of the volume). After the presentations there is an opportunity for questions from the audience. More information concerning the book can be found here. This event is sponsored by Cambridge University Press. Admission is free. The capacity of the venue is however limited. It you plan to attend, please register in advance by sending an email to Mrs. Iona Tjiong at: shares-fdr@uva.nl. See here for the video of the book launch. On 19 September 2013, Professor James Crawford will give a lecture entitled Individual and Collective Responsibility of States for Acts of International Organizations on the occasion of the publication of his new book State Responsibility. The General Part (Cambridge University Press, 2013). This SHARES Seminar will consider extra-legal perspectives on how responsibility is to be distributed among multiple wrongdoing actors. On Tuesday 5 March 2013, Professor Pierre-Marie Dupuy will give a lecture entitled: ‘The deficiencies of the international law of state responsibility relating to breaches of “obligations owed to the international community as a whole”: suggestions for avoiding the obsolescence of aggravated responsibility’. On 6 December 2012, Professor Andrea Bianchi will give a SHARES Lecture entitled: ‘My difficulties with sharing – a critique of shared responsibility’. The Conference on Foundations of Shared Responsibility in International Law, the first major conference organized by the SHARES project, will explore fundamental and conceptual issues that explain the state of law, allow for identification of gaps and provide insights on possibilities and limitations for further development of the law pertaining to shared responsibility. These questions are of theoretical and practical relevance in themselves, and will inform future developments of the SHARES project as a whole. The Conference also will be a first take on the findings of the SHARES project so far, and will allow for a confrontation with other competing and/or complementary approaches. We invite the submission of proposals for the Conference. The deadline for submission is 15 May. Proposals should be sent to Isabelle Swerissen. Any inquiry about the Conference can be directed to Dov Jacobs. Find the full call for papers here. The ECtHR Finds Macedonia Responsible in Connection with Torture by the CIA, but on What Basis? On 13 December 2012, the European Court of Human Rights (‘the Court’) found that the Former Yugoslav Republic of Macedonia (‘Macedonia’) was responsible in connection with the ill-treatment and torture of Khaled El-Masri. The judgment adds a further chapter to the Court’s rich case law on situations where a state party is held responsible in connection with the (wrongful) acts of another state. Providing weapons to Syria: a situation of shared responsibility? The continuing conflict in Syria has raised many questions of shared responsibility (see, for example, here and here). This blog post will discuss the issue of the provision of weapons and other military equipment to Syria. At his SHARES lecture at the ACIL on 6 September, Marko Milanovic discussed the relevance of his theory on the extraterritorial applicability of human rights treaties for questions of shared responsibility. Ivory Coast and Shared Responsibility: Is Everybody Responsible? Ivory Coast is quickly becoming a political nightmare. Indeed, with the evidence of crimes being committed by Gbagbo forces, as well as by Ouattara’s supporters, the international community is faced with a dilemna: if it turns out that Ouattara is indeed condoning such actions, how can he be supported by the world community, if it is to be consistent with calls for removal of other leaders who have alledgedly been involved in such situations, such as Khadafi in Libya? The result of such consistency would however be a political vaccum that might create more chaos in the country. Beyond this political dimension, the situation raises interesting issues of Shared Responsibility. In her previous post, Bérénice considered the Shared Responsibility of France and the UN in Ivory Coast. One issue that needs to be considered in addition to that is the question of the responsibility for the crimes being committed on the ground, by both sides, which is even more complex. On the 21 March 2011, after six years of research, the Special Representative of the Secretary-General on the issue of human rights and transnational corporations issued its final report which includes its guiding principles on Business and Human Rights. The general idea of the guidelines is to guarantee the implementation of the UN “Protect, Respect and Remedy” Framework. In this sense, the guidelines are a combination of references to “hard rules” and recommendations to improve prevention of violations of human rights. The New York Times reports that the Sudanese government accused Israel of an attack that destroyed a weapons factory in the Sudanese capital Khartoum. Israel denied nor confirmed the accusations, but senior Israeli officials spoke about Sudan’s role in what they said was a weapons route leading from Iran via the Sinai desert to the Palestinian militant groups in Gaza and Lebanon. After two years of difficult proceedings, a German Court in Hamburg held 10 Somali nationals responsible for extortionate kidnapping and attacking sea transportation under German criminal law. The Somalis had hijacked the German freighter Taipan in 2010, which was freed by Dutch special forces. The process raises questions as to the appropriate legal framework to address issues of modern piracy. The European Union (EU) is to impose new sanctions on Iran for its lack of cooperation in disclosing details about its nuclear program, which is suspected to be used as a cover for the development of nuclear weapons. The sanctions will likely include a ban of financial transactions between European and Iranian banks and certain trade bans. They follow earlier sanctions imposed by both the United States and the EU. On 24 September 2012, the High-level Meeting on the Rule of Law at the National and International Levels, taking place at the 67th session of the United Nations General Assembly (UNGA), adopted the Declaration of the High-level Meeting of the 67th Session of the General Assembly on the rule of law at the national and international levels. The Document reaffirms the ‘commitment to the rule of law and its fundamental importance for political dialogue and cooperation among all States’. On Wednesday 19 September, an Italian judge convicted 23 US secret agents over the 2003 abduction of Egyptian imam Osama Moustafa Hassan Nasr, also known as Abu Omar, from a Milan street in an extraordinary rendition by the Central Intelligence Agency (CIA). Abu Omar alleged that, after his seizure in Milan, he was taken to a US air force base in northeastern Italy, then flown to the US base in Ramstein, Germany, and on to Cairo. The operation was allegedly co-ordinated by the CIA and Italy’s military intelligence service. He was released after four years in prison without being charged, and currently lives in Egypt. On 10 September 2012, Kosovo was declared ‘fully independent’ as a group of 23 European countries, Turkey and the United States ended their supervisory activities. While Kosovo has been recognized by more than 90 countries, its statehood remains contested by Serbia, but also China and Russia. The State Department of the United States (US) stated that Iraq is obliged under United Nations Security Council (UNSC) resolutions to require Iranian planes, which are suspected to be flying arms into Syria over Iraqi airspace, to land in Iraq so that the cargo can be examined. Iranian flights over Iraqi airspace were suspended in March, after the US objected, but flights resumed in July. According to US intelligence, these flights were carrying military equipment and weapons. Iraq’s Prime Minister Nuri Kamal al-Maliki stated he was assured by Iran that these flights only carried humanitarian aid. According to former and current Iraqi and United States government officials and experts on the Iraqi banking sector, Iraq has been aiding Iran to circumvent international financial sanctions, imposed on Iran because of its nuclear program. One bank, the Elaf Islamic Bank in Baghdad was barred from any dealings with the banking system of the United States. According to President Obama, this bank has ‘facilitated transactions worth millions of dollars on behalf of Iranian banks that are subject to sanctions for their links to Iran’s illicit proliferation activities’. Iranian organizations gained, according to said sources, ‘effective control over at least four Iraqi commercial banks through Iraqi intermediaries’, giving Iran access to the international financial system. The African Court on Human and Peoples’ Rights has ruled in Femi Falana v. African Union that the African Union cannot be sued before the Court on behalf of, or for obligations attributable to, its member states and that it is not subject to obligations arising from the Protocol to the African Charter on Human and Peoples’ Rights on the Establishment of an African Court on Human and Peoples’ Rights. Negotiations were held in New York from 2-27 July in order to reach an agreement within the United Nations (UN) framework on the regulation of international trade in conventional arms. The aim of the UN Conference on the Arms Trade Treaty (ATT) is to establish common international standards for import, transfer and export of conventional arms. These international standards can be used to hold those who sell weapons in an irresponsible manner accountable. As part of U.S. efforts to fight drugs, an elite unit of Ghana’s counternarcotics police is trained by U.S. officials. There are plans to train other counternarcotics police squads in Kenya and Nigeria under the so-called ‘West Africa Cooperative Security Initiative’. (West) Africa is increasingly seen as ‘the new frontier’ in terms of counternarcotics, since cartels from Latin American are more and more using pooly governed states in Africa to smuggle cocaine into Europe. Third state involvement in Israel’s settlement activity which can be characterized as recognition, aid or assistance is incompatible with international law. A state can be held responsible for such wrongful conduct in accordance with the ILC Articles on State Responsibility. This conclusion is reached by James Crawford, professor of international law at Cambridge University, in his opinion on ‘Third Party Obligations with respect to Israeli Settlements in the Occupied Palestinian Territories’. The opinion, which is directed towards European governments in general and Great Britain in particular, could inject fresh momentum into campaigns which seek to block the import of produce from settlements. Israeli settlements in the West Bank are considered illegal under international law. The United States have asked Rwanda to stop arming or otherwise supporting armed rebels in the neighbouring Democratic Republic of Congo, including the M23 led by Bosco Ntaganda, who is wanted for war crimes by the International Criminal Court. The request follows a UN report released on 29 June, which raised the allegations of aid and assistance provided by Rwanda. A group of C.I.A. officers in the south of Turkey is reported to assist allies of the Syrian opposition in deciding which opposition fighters will receive arms from neighbouring states. These arms are reportedly paid for by Turkey, Saudi Arabia and Qatar. Furthermore, the C.I.A. is said to share intelligence information with the Syrian opposition. United States Secretary of State Hillary Clinton accused Russia of providing the Syrian government with attack helicoptors. The accusations coincide with the UN’s characterization of the armed conflict in Syria as civil war. Security researchers think a data-mining computer virus named ‘Flame’ is sponsored by the same entities that ordered the ‘Stuxnet’ virus. In 2010, the Stuxnet virus, which was co-sponsored by Israel and the United States, severely damaged centrifuges in Iran that were used for Iran’s nuclear programme. On April 06, 2012, on the 18th Anniversary of the genocide in Rwanda, the President of the U.S. Barack Obama issued a statement in which he refers to the ‘haunting’ memory of the extermination of about 800,000 Tutsis and moderate Hutus. He further mentions a shared responsibility of all States to protect populations and to prevent the occurrence of genocide. More specifically, he affirms that the anniversary of the Rwandan genocide ‘reminds the nations of the world of our shared responsibility to do all we can to protect civilians and to ensure that evil of this magnitude never happens again’. Today, the Dutch Supreme Court affirmed the Hague Court of Appeal’s decision that it does not have jurisdiction to deal with the claim of the Mothers of Srebrenica against the United Nations. The Mothers of Srebrenica instigated proceedings before Dutch courts against both the Netherlands and the United Nations, claiming they had failed to prevent the genocide in Srebrenica. The plaintiff’s submission that UN immunity should be set aside in order to ensure the right to a fair trial in Article 6 ECHR was rejected. The Supreme Court held that the Court of Appeal erred in relying on the criteria in the ECtHR cases Beer and Regan and Waite and Kennedy in order to evaluate whether UN immunity should be set aside for the right to a fair trial. The Supreme Court held that the immunity of the United Nations is absolute, and that obligations under the UN Charter should prevail over obligations arising from other international agreements according to Article 103 UN Charter. In this context, the Supreme Court followed the ECtHR’s decision in Behrami and Saramati. The plaintiff’s submission that in case of breaches of peremptory norms the UN is not entitled to immunity was also rejected. In order to support its decision that rules of ius cogens do not set aside rules on immunity, the Supreme Court referred to the ICJ’s recent judgment in the case Germany v. Italy. The Mothers’ claim against the Netherlands is yet to be considered in first instance. In a special report entitled ‘Profit and Proliferation’ (Part I and II) in the New York Times’ At War blog, Belgium journalist Damien Spleeters reports how Belgium arms entered and were used during the conflict in Libya, and discusses the question ‘how much responsibility Belgium and other European countries may share in weapons proliferation in the region’. Source: New York Times | Profit and Proliferation, Part 2: Will Belgian Arms End Up in Syria? On 21 March 2012, the District Court of the Hague awarded €1 million ($1.33 million) in compensation to a Palestinian doctor tortured and jailed in Libya along with five Bulgarian nurses for purportedly infecting children with the AIDS virus, the doctor’s lawyer said Tuesday. The award is directed against 12 former Libyan government officials who were responsible for the torture. Initially the claim was also directed at Gadaffi, but the Dutch government took the position that he had immunity and the complaint thus could not be served to him, after which his name was removed from the claim. As to the others, no issue of immunity was raised by either the government or the court, and the defendants did not appear. A parallel claim against Libya, that until now has refused to pay compensation, is pending before the Human Rights Committee (raising interesting questions of shared responsibility between states and individuals). After the latest double veto against a Security Council (SC) Resolution to take action against the crackdown in Syria, the Arab League has now called for a joint UN-Arab peace mission. In doing so, the League stated that a “special responsibility” rests on the League, due to the failure of the SC to reach an agreement. On the UN side, the General Assembly (GA) has taken up discussion of a resolution similar to the one which was vetoed in the SC. High Commissioner for Human Rights, Navi Pillay, addressed the GA on Monday and again stressed that Syria has manifestly failed to assume its responsibility to protect and responsibility now lies with the international community. She added that it is likely that crimes against humanity are taking place and that she has requested the SC to refer the situation to the International Criminal Court. The recently published book The ICJ and the Evolution of International Law. The enduring impact of the Corfu Channel Case (Karine Bannelier, Theodore Christakis and Sarah Heathcote, eds), Routeledge, 2012, contains several contributions relevant to shared responsibility. Sarah Heathcote examines state omissions and due diligence, Olivier Corten and Pierre Klein discuss the limits of complicity as a ground for complicity; and Pierre d’Argent discusses reparation, including questions of multiple causes. The International Court of Justice finds finds that Greece, by objecting to the admission of the former Yugoslav Republic of Macedonia to NATO, has breached its obligation under Article 11, paragraph 1, of the Interim Accord of 13 September 1995. Shared responsibility for injury despite the existence or not of a wrongful act? A new blog post on shared responsibility for injury despite the existence or not of a wrongful act, inspired by the discussions during the recent Conference on the Foundations of Shared Responsibility in International Law, can be found on International Law Observer. A new book on ‘Complicity and the Law of State Responsibility’, written by Helmut Philipp Aust, has recently been published by Cambridge University Press. In an honest, critical and thoroughly researched manner Aust covers several SHARES issues through the lens of a principle of complicity. His definition of complicity is thereby inspired by Article 16 of the ILC Articles on State responsibility (ILC ASR). This Article (on ‘aid and assistance’) and Article 41 ASR (on non-assistance, non-recognition and cooperation in the face of serious violations of peremptory norms of international law) consequently form the main focus of the book. The study in detail addresses the content of these Articles and their relation to an international legal system that in Aust’s view increasingly involves an international rule of law and community interests. In doing so, it touches upon several adjacent SHARES issues such as the ‘Monetary Gold principle’ and bilateralism in international law. More information about the book can be found here. The Pacific island nation of Palau announced plans on 22 September 2011 to seek an advisory opinion from the International Court of Justice on whether countries have a legal responsibility to ensure that any activities on their territory that emit greenhouse gases do not harm other States. A new book on ‘Accountability for Collective Wrongdoing’, edited by Tracy Isaacs and Richard Vernon, has recently been published. More information about the book can be found here. In its Grand Chamber judgment in Al-Skeini and Others v. the United Kingdom, the Court decided that the United Kingdom was required to investigate the deaths of six civilians killed in Iraq in 2003 in incidents involving British soldiers. The Court also delivered its Grand Chamber judgment in Al-Jedda v. the United Kingdom, in which it opined that the three-year internment of an Iraqi civilian by the British forces in Iraq had breached the Convention. In para. 80 of the latter case, dual or multiple attribution of the same conduct to the UN and a State was held to be possible. More information about these cases can be found in a blogpost on EJIL: Talk! by Marko Milanovic. The Dutch state is responsible for the deaths of three Muslim men after the fall of Srebrenica during the 1992-5 Bosnian war, a Dutch appeals court ruled. The Court, in this groundbreaking judgment (only available in Dutch), explains that the notion of effective control determines who carries responsiblity for acts by troops acting in relation to an international organisation. It holds that more than one actor can exercise such control over troops, opening the way for a case of shared responsbility in which the Dutch State, irrespective of the effective control on the part of the UN, can be held responsible. On 3 June 2011, the ILC adopted the Draft Articles on the Responsibility of International Organizations, on Second reading. The statement of the Chairman of the Drafting Committee is available here. The Department of International and European Law of the University of Amsterdam has added a new course on Shared Responsibility in International Law to its curriculum. The course is taught by Professor André Nollkaemper and Dov Jacobs and is intended to make students understand how international law deals and could better deal with the questions of international responsibility in situations when multiple entities are involved in the occurrence of damage. Germany has deployed some of its police to Saudi-Arabia to train Saudi-Arabian police in border control measures. The police was deployed without parliamentary consent and merely on the basis of an executive order. Moreover, the deployment is linked to a State contract between Saudi-Arabia and the European Aeronautic Defence and Space Agency (EADS) with the objective to build a 9000 km high-tech border fence in the Saudi-Arabian desert. In doing so, the German police may have aided the Saudi Arabian police in “more effectively” fighting the opposition forces during the democratic spring in the Arab region. Following a symposium held last year on the topic ‘Does the World Still Need United States Tort Law? Or Did It Ever?’, a contribution by Roger Alford has been published in the Pepperdine Law Review on one of the core issue dealt with by the SHARES Project, namely, the apportionment of responsibility amongst multiple actors. Professor André Nollkaemper will participate in a discussion on ‘Shared Responsibility in International Law’ at a conference in Antwerp on the topic ‘Beyond Territoriality: Globalisation and Transnational Human Rights Obligations’. The conference takes place between 19 and 21 May 2011 at the University of Antwerp.